Holy smokes! I must find these! ^o^ I actually prefer dark chocolate over milk chocolate, so I’m delighted. 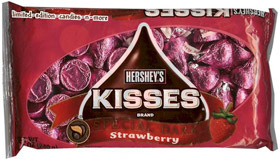 I’m hoping Hershey’s will eventually come out with… Banana Kisses! Chocolate and banana?! *Swoon! 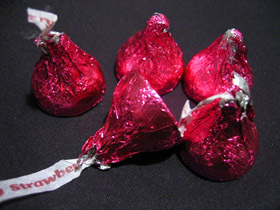 * ^o^ Still, strawberry is my second favorite flavor for fruit candy, so I’m going to be on the look-out for these! I always have to try every new Kiss that comes out… These sound like winners! where can i find these??? ?